Citizens Restoring American Chestnut tree. Photo courtesy of Bernie and Linda Coyle. Originally funded by the Chesapeake Bay Trust, the Citizens Restoring American Chestnuts (CRAC) project represented a partnership between the American Chestnut Foundation (TACF) and the Appalachian Laboratory of the University of Maryland Center for Environmental Science. Over the period of two years, the project distributed seeds and seedlings obtained from different American chestnut sources to interested community members throughout western Maryland. In exchange for the seeds and seedlings, community members agreed to report back to scientists at the Lab on the overall health, growth, and survival of their trees. In this way, community members took on the role of citizen scientist, playing an integral part in the success of the project. The project's citizen scientists continue to report on their trees, creating a rare and invaluable long-term dataset and providing scientists an opportunity to study the trees through maturity. We hope to once again expand the program in collaboration with TACF and to collaborate with the Garrett County Forestry Board to pollinate local trees for planting in orchards and through CRAC participation. We will continue to look for funding to maintain and expand our efforts - from pollinating a few chestnut trees, to developing seed orchards, to examining the chestnut genome for ways to discern local adaptation. 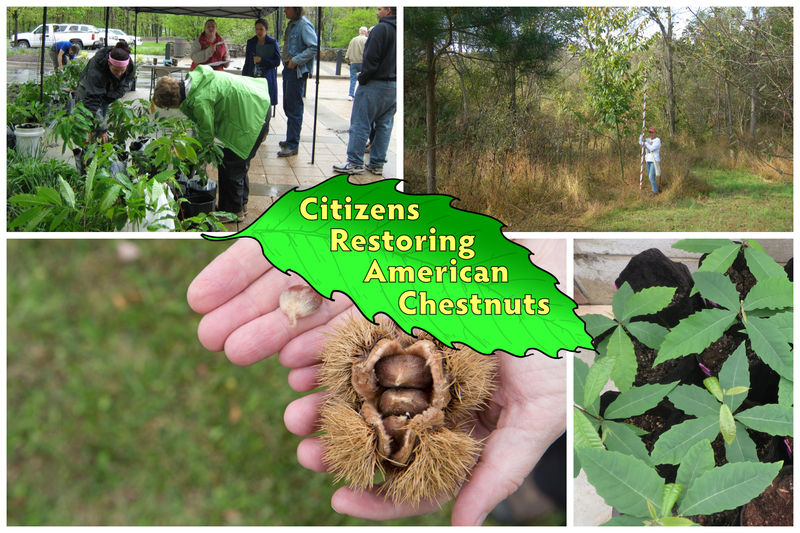 Citizens Restoring American Chestnuts citizen scientist Bernie Coyle with project tree. Photo courtesy of Bernie and Linda Coyle. Citizen scientist Joe Kroll with his 8ft American chestnut. Photo courtesy of Joe Kroll. Citizen scientist Joe Kroll's project trees. Photo courtesy of Joe Kroll. Support Appalachian Laboratory research efforts to restore the American chestnut.